Let's start this out by clarifying: I don't have a seven year old. No magical three year olds turning into seven year olds over here, just me bending the ears of some mothers who DO in fact have seven year olds. Three years ago, when I was a newly minted mother in Los Angeles, I had a baby shower. Schedules worked out in such a way that we had the shower when my little man was about eight weeks old. I was a new mother with a colicky two month old, and I was hurtin. I was in the trenches. I was drowning. I was in over my head. I was all the things. Jake cried pretty much incessantly from the time he was two weeks old to the time he was eight weeks old. I would sit in my room and nurse him, rock him, sing to him, walk him around, or any combination of those things. And I would wonder if he was ever going to stop crying. I mean this literally. In my sleep deprived state, I thought my baby might just cry forever, and I didn't even realize how absurd that thought was. I had to reason myself away from it. I told myself that I certainly didn't know any adults who cried all the time. Then I considered toddlers: I knew two and three year olds had tantrums, but I was pretty sure they didn't cry all the time either. And with this logic I was able to see some glimmer of hope out of the hole of "my baby spends every waking minute crying." You might think I'm exaggerating. But I'm not. So this shower was right before I got some reprieve from all the crying, and the narrative was pretty set in my head: I didn't like this whole mothering gig and I was pretty bad at it. Two of my earliest LA buddies - and now blogging buddies - were at the shower: Blythe, one of the shower hosts, and Kendra, who'd sewn Jake a yellow and black quilt with honey bees on it. Kendra was pregnant with her sixth at the time, and at some point as we were opening presents, someone asked her what item she recommended most for newborns and she said: "A seven year old." I've thought back to the moment many times over the last three years, and already, even though I have more to deal with now that I have two, it's getting easier. That's a phrase that gets thrown around a lot: "It gets easier." I've spoken with mothers who have struggled with the transition from one to two, or mothers whose struggles peaked at three under four. And then of course, others like me who had rocky rocky initial transitions to motherhood. We cling to that truth: "It gets easier." But we cling to it guiltily because we know we shouldn't wish the time away. Some of my favorite moments in blogs of mothers who have older (but still little) kids are the "throwback" moments when they talk about what it was like when they only had babies and toddlers at home. 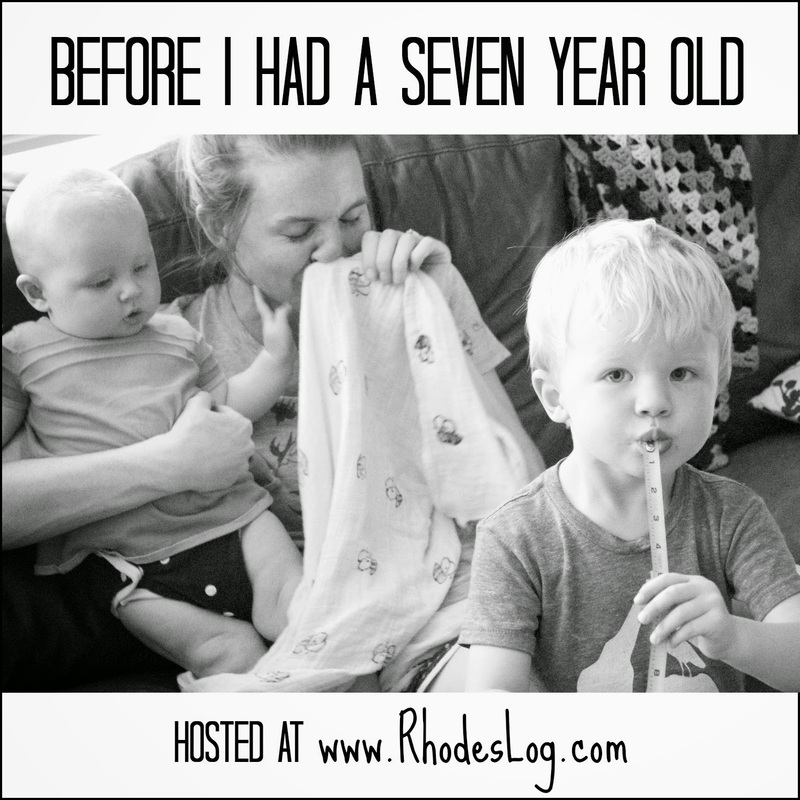 So I reached out to a few of my blogger friends and asked them some questions about what life was like when they only had very little children in the home, and over the next few weeks I'll be publishing their responses in a series called "Before I Had a Seven Year Old." We'll kick it off tomorrow. I hope this little series will encourage new moms who have very recently had their lives turned upside down by motherhood and could really benefit from a seasoned mother's perspective. If you're a mother of not just babies and toddlers and would like to write/have written your own "throwback" post about what life was like when you were still adjusting to motherhood, I encourage you to link it up here. Kate! You may or may not remember me--we met at Edel. :) (I actually was reading your blog even before that, and I felt like such a dope when I got home and realized, "OH, that was Kate RHODES!") Anyway--back on topic--thank you for this wonderful idea! I remember reading this post of Simcha Fisher's (http://www.ncregister.com/blog/simcha-fisher/to-the-mother-with-only-one-child) and finding it so very, very encouraging. What a blessing this will be for new (or not-so-new) moms! I think I've read Simcha's post at least 25 times in the six months since I became a mother. Can't wait to hear what others have to say! So looking forward to this, what with my crazy almost-3-year-old who STILL thinks she's a cat, and my 7-month-old with the new teeth (which means some days I get bitten by ALL the kids). Yes! I'm ready to read every morsel. I have 3 under 5. There are a lot of days when people visit that I just want to grab their shoulders and say, "THIS IS SO HARD!" Instead, I usually just go with, "oh, haha, things are crazy around here..."
Such a great idea! Do any of them share how to acquire said 7 year olds? Pretty sure my 3 year old won't morph. Excited for this series! So I don't blog. So no post from me. But I'll comment....! I always feel like I "cheated" a little in the baby/toddler department. My husband was married before and came into our marriage with a 5 year old daughter - and he had full custody, so she lived with us. So when we had our first baby together, I already HAD a 7 year old! And let me tell you - it rocked. That doesn't mean that having a new baby wasn't hard - it was. And when the next baby came along, I had a 9 year old, a two year old and the baby. So having a baby and a toddler was still hard - on the flip side, I never felt like I was immersed in the "moment" of having a baby or a toddler, because I was also needing to be there for an older child who had activities and "stuff" - so no matter what, you're always divided and it's just hard. But lovely too. And having the 7-year old is transformative. Someone to fetch a diaper, or play with a toddler when the baby is fussy, or watch the baby in the bouncy seat so Mom can shower. It's the little things...! :) And it does get easier - really. "It's the little things" is so true. My life right now is just chock full of little things - some big things, but mostly just lots and lots of little ones. Cleaning little bits of food out of the high chair. Fishing little bits of paper out of a baby's mouth. Putting little undies on an uncoordinated three year old. And if anyone could just take over some of those little things: it would be HUGE. This is awesome, I can't wait to read a lot of these :-) I remember hearing a lot of stories from other mom's about when it was really hard for them. It's what got me through that tough first few months. I've got another one on the way and I can only imagine what the adjustment will be like with two. What a great idea, Kate! Thanks for doing this. I look forward to reading the series. Love Blythe & Kendra. Can't wait for the wisdom to pour down. As a mom of a four year old, two year old, and 12 week old, I would love to hear it. Preach, sister! I'm right there with ya, Nell. Well, excited I only have one little tot totting around the place. I'm excited to follow this, Kate! Not sure if I have too much wisdom here, but certainly I've got some funny stories that will at least help you forget your woes temporarily. In other words I'm all over this like white on rice. Thanks for the idea! Love the idea.. I need the wisdom of experienced mamas on a daily... make that an hourly.... basis! This sounds great. I'm excited to read along. Hi Kate! I've stopped by before, but I'm not sure if I've ever commented. This topic is really funny because just last night, my 8.5 and 7 year olds were playing with the 20 month old twins of my husband's boss' boss. Their mother was *shocked* by how happy the kids were! but I wasn't. My sister was 7 when my eldest was born and whenever she came to visit/we visited my parents, it was like magic. Older kids are a gift every new mom deserves. Oh my goodness...I remember being at Blythe's house when you were there with baby Jake. Yes, the crying. I remember the crying. I can't remember if I had my first yet or if I was still pregnant. I just remembering thinking, oh that poor girl... I totally understand the frustration. What a great idea for a series. I can't wait to hear all the advice. 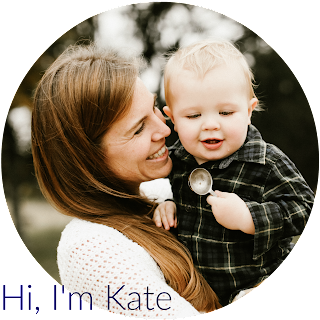 Kate, this blog series is beyond genius. As mom to an infant, I'm really looking forward to reading about how this mom gig gets easier down the road. So glad you are doing this!! Kate!! My oldest is about to turn 8 in a couple weeks and this is SO TRUE!! My youngest, Dominic, is so much fun, but he is such a high needs baby and I do not know what I would have done had I not had my 7 year old!! Thank you for this series!! I stumbled onto your blog a while ago and really enjoy reading it. I feel like I'm reading my own thoughts sometimes. This series is awesome. I have an almost two year old (next week, yikes! ), and this is such encouragement. Keep 'em coming! Nice web page to post comment.